So anyway, this seems like a pretty smart idea to me… I personally think a Wal-mart gift card is the most useful. Once you have the $900 set of China out and you can’t afford to put Ramen noodles on it, the Wal-mart gift card starts looking really good. I can understand the draw of Cash Wedding Registries. 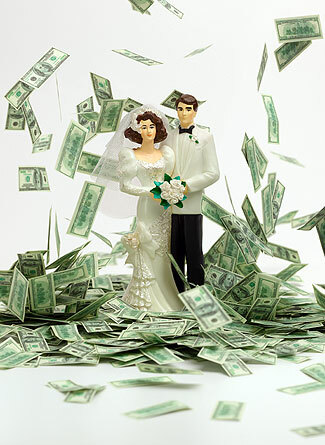 Of course, most couples need to discuss the money problems they are bringing into their marriage. This includes student loans, credit card debt, and any other type of debt that will become shared debt once you are married. You might also want to consider having a discussion about your credit scores as well. This is an important consideration because a poor credit score can have a negative impact on your buying power for a house or a car…… or children…. not that people buy them….. well I guess adoption is kind of like that…. Starting out a marriage financially ready could make the difference between a long and happy marriage and one that ends too soon. Here’s a great little blog with some helpful tips – http://weddingideafavorites.wordpress.com/. A little cash upfront in the beginning can’t hurt the newlyweds can it? I really appreciate the time you put into these wedding articles. Keep it up! !